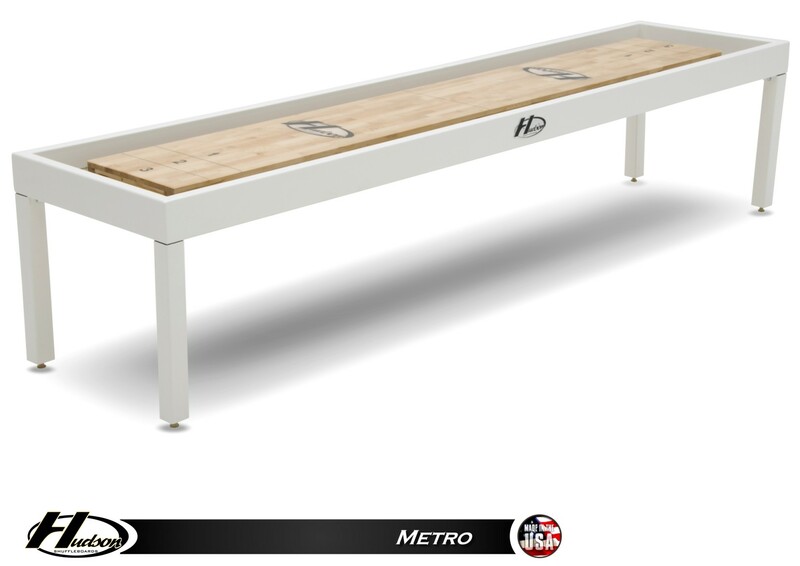 Looking to add a touch of the contemporary to your game space? 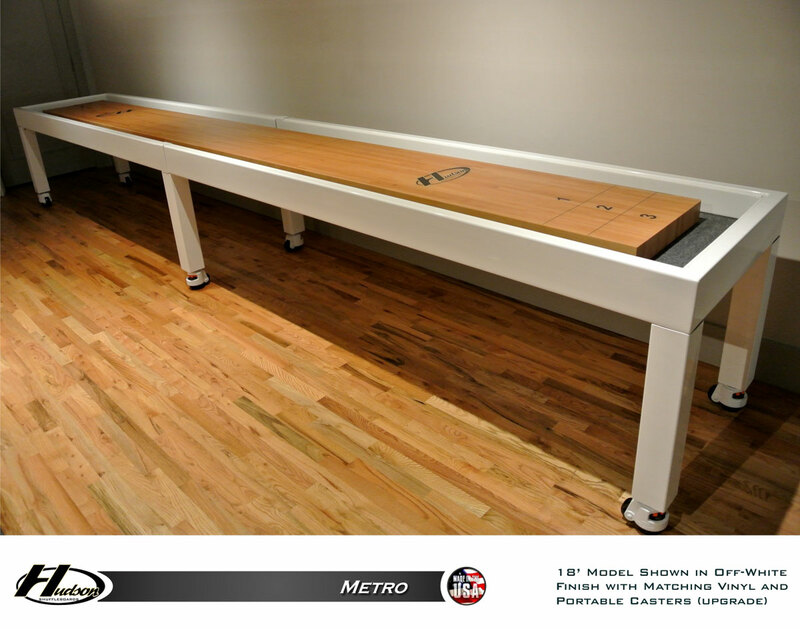 The 9' Metro shuffleboard table from Hudson shuffleboard tables brings together modern styling and the classic game of shuffleboard. 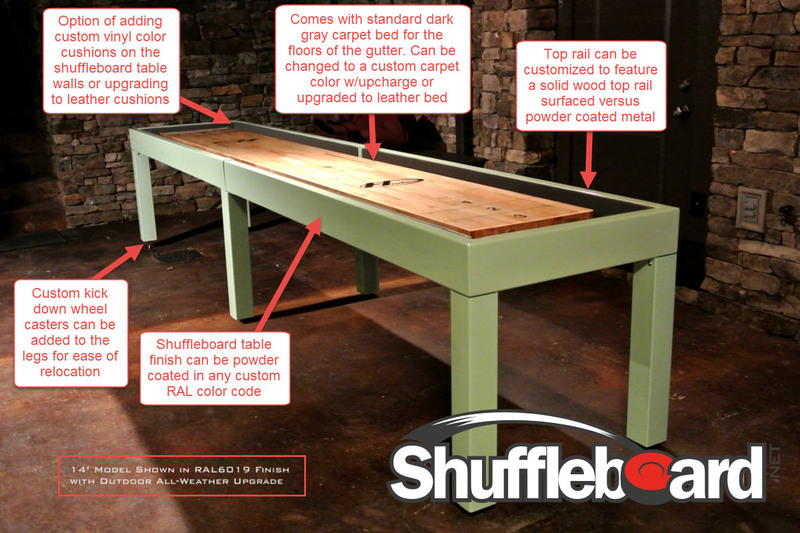 This handcrafted USA-made shuffleboard table is constructed of powder-coated steel. 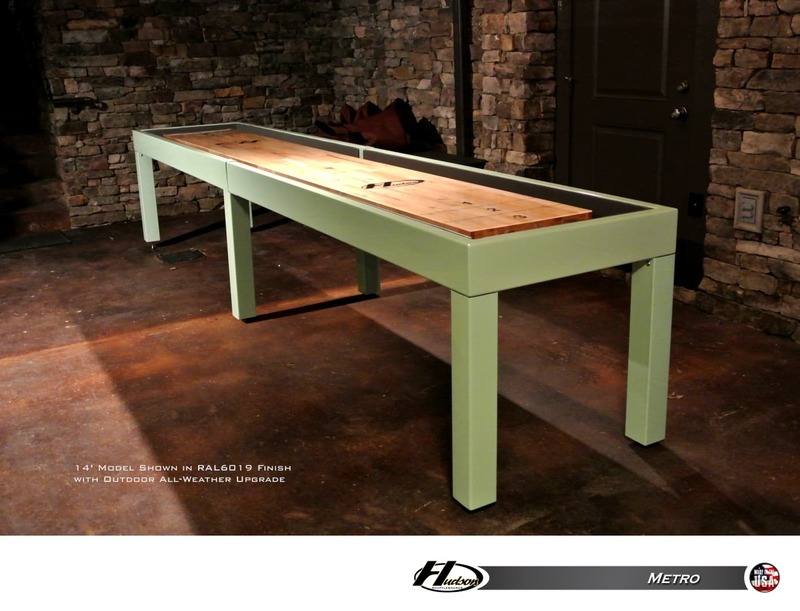 The Metro's cradle can be finished in any color shown, allowing you to ensure your Metro shuffleboard table fits you and your decor. The cradle bed comes in grey carpet and the inside of the cradle walls are lined with a vinyl wrapped cushion. 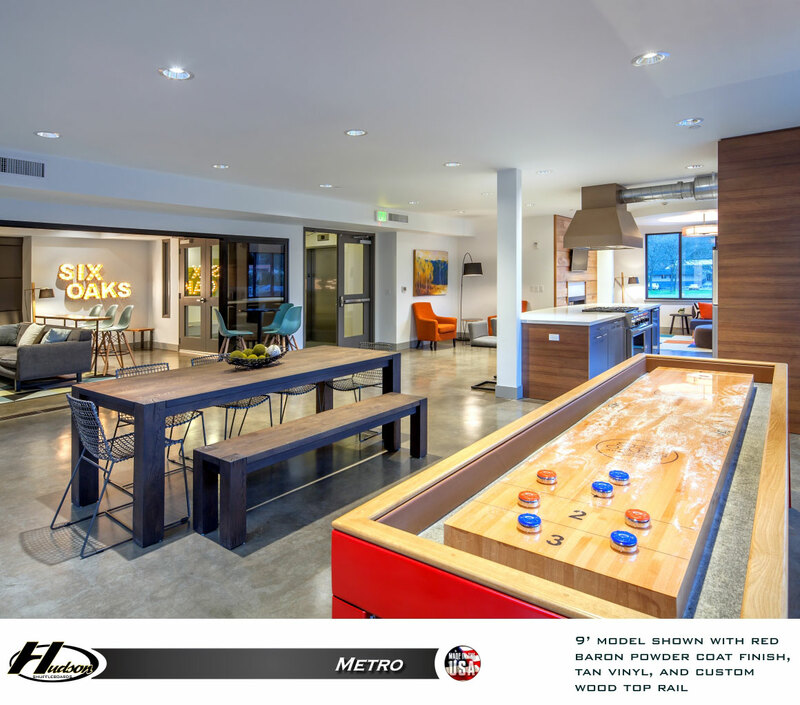 Both the playing surface and carpet can be upgraded to all-weather materials, giving you the option to take your playing experience outdoors. 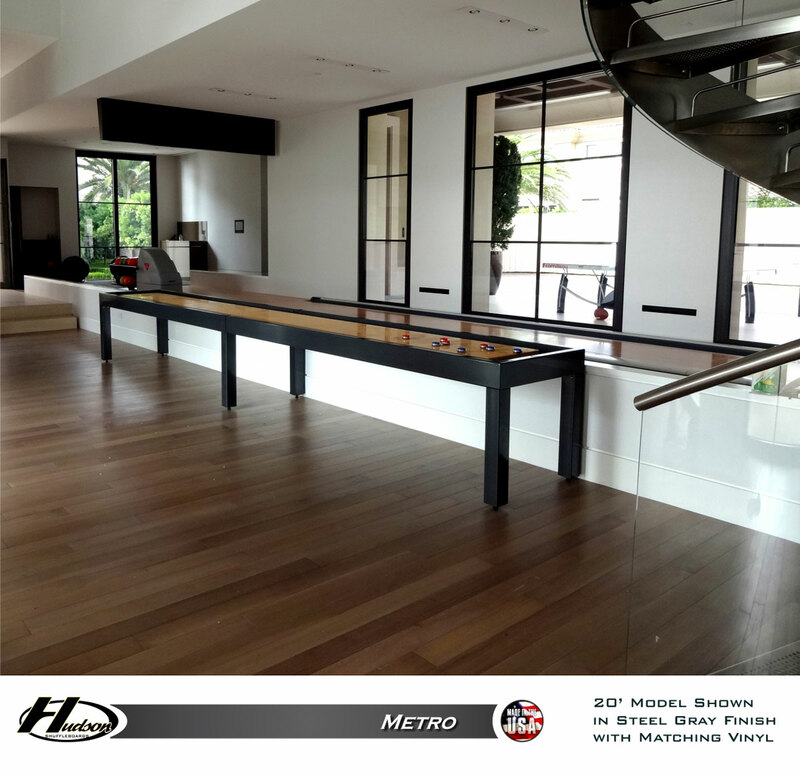 Enhance your entertainment space with the perfect balance of traditional and modern, and order the Metro today! 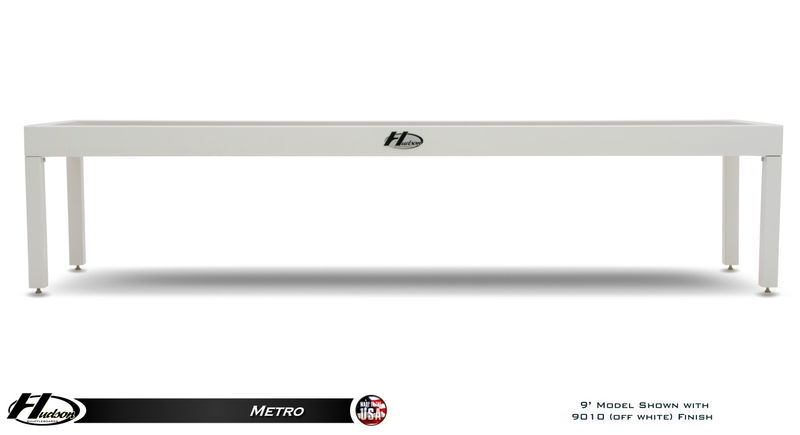 *Please note that the solid wood top rail custom option cannot be added for "weather proofed" tables intended for outdoor use. 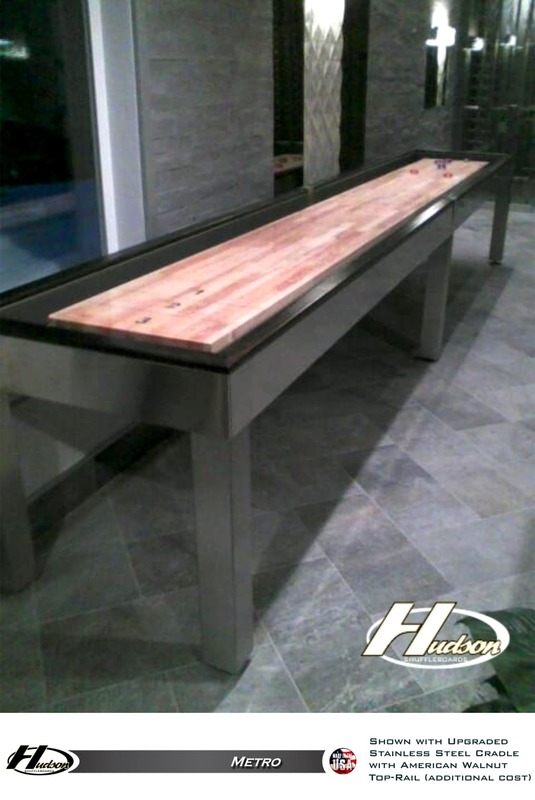 The reason being is that moisture/condensation will collect under the wooden rail which makes contact with the shuffleboard table frame, and cause mold and deterioration to the wooden top rail over time. 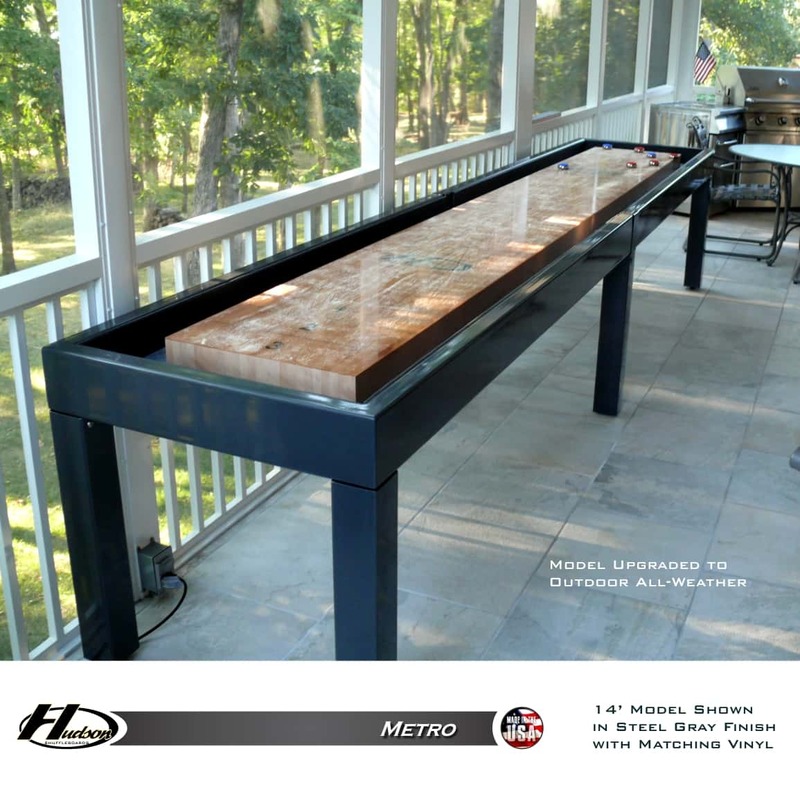 Now you can enjoy this table outdoors! 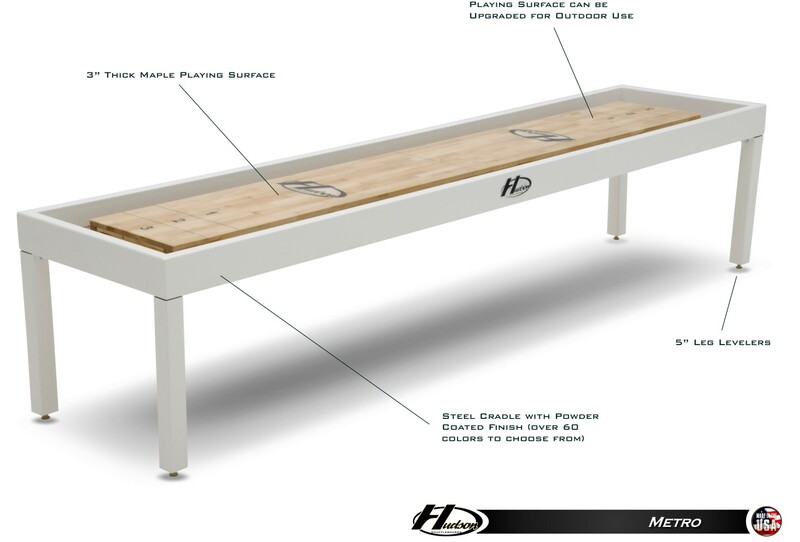 This option means that your table will be customized for outdoor use from head to toe. 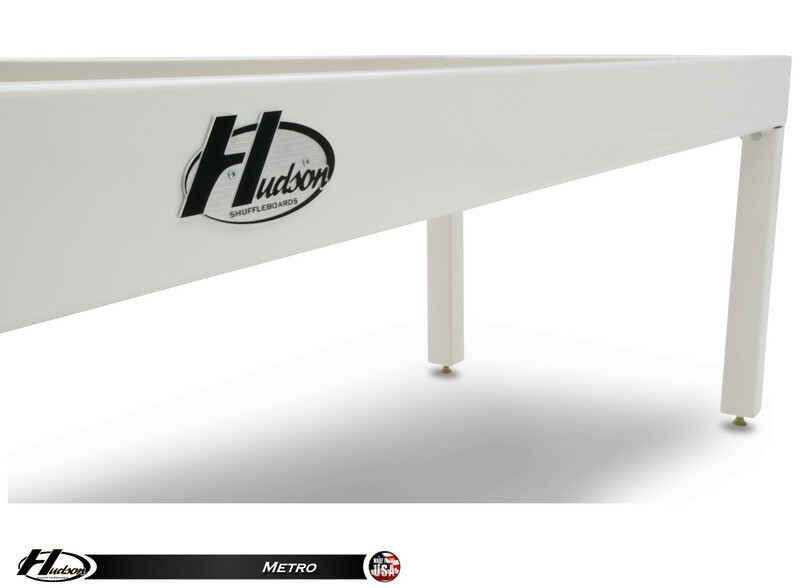 The cradle and playing surface will be sealed with waterproof fiberglass. 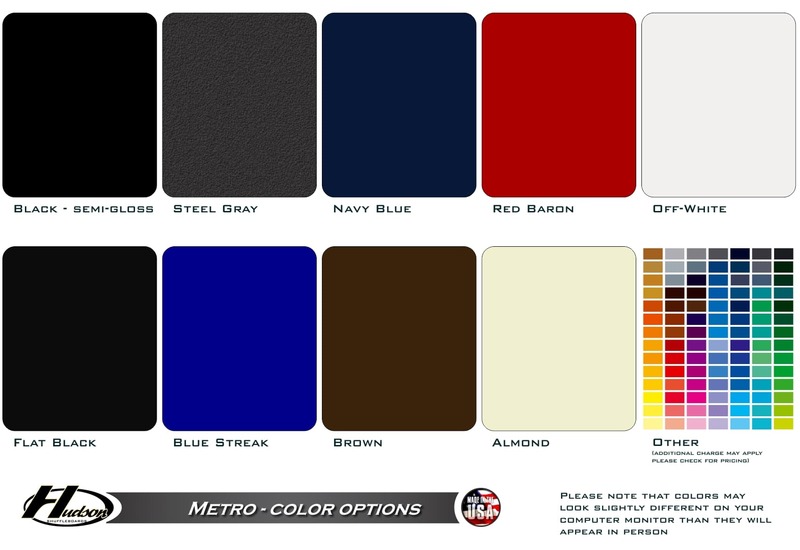 The carpets will be replaced with marine-grade carpeting for extra durability. 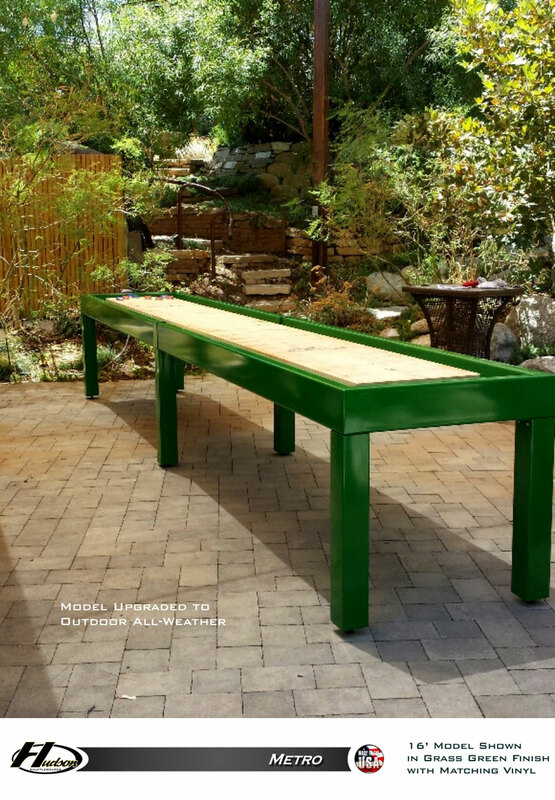 You can utilize the table in an outdoor environment year round as long as you keep the table covered with the Sunbrella table cover that will be included with the weather proofing option. 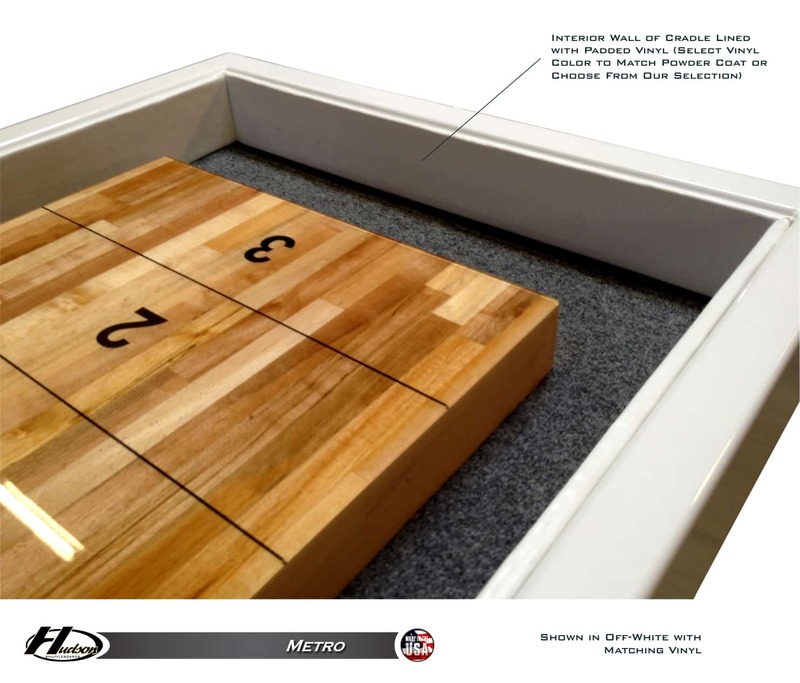 Have your own custom logo instead of the manufacturer logo on the shuffleboard table, all we need is a .AI or .EPS file format of your custom logo and we'll make it happen!